Doesn't the title look really valuable? To reproduce this effect you need the incredible "Lighting"-Plugin, created by Tom Bech and Federico Mena Quintero. It is not in the standard gimp-1.0 distribution, you have to install it yourself. It can be found at <Image>/Filters/Light Effects/Lighting Effects. This Plugin does a very good Bump-Mapping. Additionally it can map an enviroment-map to the image. The trick is to use a good enviroment-map. 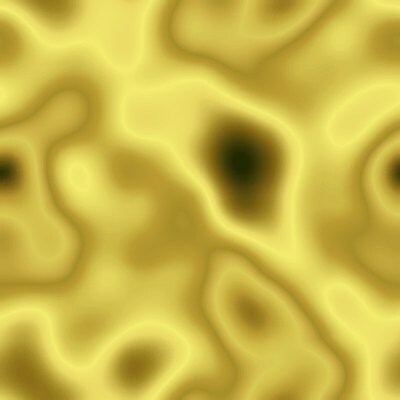 I created it with <Image>/Filters/Render/Solid Noise (X/Y-Size: 2.8, Detail: 1, Tileable). It is important for a good effect to get different grays in the top right corner. Then I did a <Image>/Image/Colors/Auto-Stretch Contrast and a <Image>/Filters/Blur/Gaussian Blur (IIR) with a radius of 5 to get the full range of gray. Then select the "Golden"-Gradient in <Image>/Dialogs/Gradient Editor... and <Image>/Filters/Colors/Gradient Map it to the image. The next step is to create a bumpmap for the text. Open a new grayscale image in the desired size, fill it black and paint the white text on it. To get a smooth transition do a Gaussian Blur on it. Then open a new RGB-Image with exactly the same size and start the Lighting-Plugin. Select the "Enviroment-map"- and "Bumpmap"-Toggles and select the images in the appropriate notebook-pages. I prefer a lower value in the "Maximum height" Bumpmap option. I think 0.02 is good in most cases. This is the result after a click on Apply. There is room for Improvements. Since the Lighting-Plugin doesn't support antialiasing yet it is a good idea to render the image in the double size and scale it down for the final image. Some other neat tricks can be found on the next page.